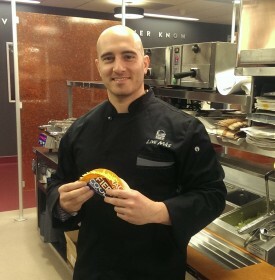 Share the post "Alumni Story: Steven Gomez (Cook ’01, GSNB ’10): Thinking Outside the Bun"
Steve Gomez in his test kitchen. The next time you go into a Taco Bell, look for the poster promoting the Doritos Locos Taco and thank alumnus Steve Gomez for his role in making this wildly popular taste treat a reality. The distinctive orange shell – mimicking the Nacho Cheese Doritos corn chip – is filled with the traditional seasoned ground beef, lettuce and cheddar cheese in the “regular” version, and topped with chopped tomatoes and sour cream in the “supreme” edition. It looks like a very simple dish. But don’t tell that to Steve, who worked in test kitchens in Taco Bell’s Irvine, California, headquarters and manufacturing plants around the country for years to perfect it. The challenges? First, stabilizing the delicate Doritos shell to be able to hold the taco ingredients and, believe it or not, figuring out how to apply cheese dust on the shells so that customers could get that telltale orange coating on their fingers as they do when scarfing Doritos. The collaboration between Taco Bell and Frito-Lay, which makes the Doritos brand, was a natural one. PepsiCo was the parent company of both until it spun off its restaurant division. Steve Gomez went to work for PepsiCo after his graduation from Rutgers in 2001 with a B.S. in Food Science. While he was working, he pursued his master’s degree in Food Science, completing it in 2010. Steve didn’t come to Rutgers with Doritos Locos Tacos – or even food science – on the brain. As he describes it: “I grew up in Union, NJ, and chose Rutgers University because it is a great state school educationally and value-wise. I started at Livingston College, and I remember while I was in a business class, I started daydreaming about creating foods – things like food supplements for athletes or just new food products I wished I could buy. He points out, “Having a Food Science major allowed me to draw from a vast number of disciplines: chemistry, physics, engineering, biochemistry, etc., and apply them to understanding the physical and chemical makeup of food. I was always interested in science and innovation, but I also knew I didn’t want to be locked in a lab running experiments with harsh chemicals all day.